For today’s fabulous video I have for you a tutorial sharing how to pose like a pinup queen! I’m showcasing the classic pinup pose which you can see so many iconic pinup girls capturing from vintage to modern times. I’m breaking down from head to toe how to structure your body to always look fabulous in a photo. This is the first part of my new series breaking down pinup posing for photoshoots, performances and many other occasions. I’ll have a follow up video very soon. Be sure to subscribe to my channel to never miss a video! 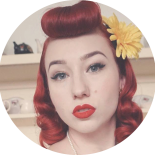 This entry was posted on September 25, 2018 by Miss Lady Lace in Pinup, tutorial, Videos, YouTube and tagged 1940's, how to pose, miss lady lace, perth, perth pinup, perth pinup blog, pin up, pinup, pinup blog, pinup blogger, pinup fashion, pinup girl, pinup life, pinup lifestyle, pinup pose, red lips, retro blog, vintage, vintage blog, vintage blogger, vintage perth, vintage pinup blog.